As days grow warmer and longer, coats and sweaters are put away, and we wait anxiously for spring to burst in our gardens! The cold, grey days of winter begin transition into spring’s warmth and sunshine, and the outdoor beckons us. 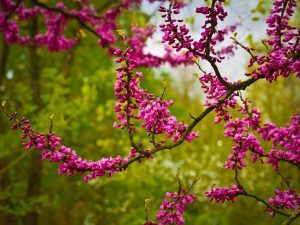 Crocus, daffodils and tulips are blooming, grass and trees are budding, and our inner temperments begin to awaken from the lull of winter’s cool, dark Yin energy. Spring is when energy starts to build and grow. Animals come out of hibernation, green sprouts everywhere as buds begin to bloom. Our bodies feel the brighter, longer days, and we want to get Ch’i moving. In winter Ch’i enters deeper into the body and it’s natural to want to sleep longer and spend less time outdoors. Now we are transitioning from winter to spring, so it’s a good time to go outside and get moving! Some days may seem mild, but it’s critical to stay warm to prevent getting sick. Changing activity level, diet and noticing your emotions can make the transition easier on body and mind. Here’s some tips to keep energy up this season! Yoga for Balancing Chi invigorates for Spring! Here’s a Yoga sequence to tone and calm the Liver. Be Kind to Yourself – Life can be overwhelming, so take it easy. Walk outside, breathe fresh air & connect to trees. Try Milk Thistle (at health food stores)- it supports the liver. Try a tea, tincture, or supplement. Do Yoga, Chi Gung, Tai Chi & outdoor activities. Wear Colour – add someting bright to your wardrobe, and notice how it lifts your mood. Eat Healing Foods – leafy greens and sprouts are good. Drink warm, clear soups and tea. Sour tastes balance Liver, so add lemon to water. Walk barefoot. Liver Chi enters thru feet; connection to Earth is vital. Release stress by laughing and having FUN!